I am imagining the populist sentiment: "About time those banks got some of their own back!" But this won't make much difference to the banks, that will simply pass on the costs to shareholders and consumers. This is effectively a tax increase on anybody who has a bank account and anybody who has a superannuation fund - in effect, almost everybody of working age. The Treasurer, Scott Morrison, saying "Cry me a river" sounds funny, but the populists should be crying in their soup, even though they won't because, despite paying more, they will do so without knowing. As a political scientist, this is the part that fascinates me. Extracting more revenue from successful Australian industries is now de rigueur. Australia's penchant for tall poppy syndrome lends popular support for governments to go after any part of the economy that dares to do well. Sometimes there is good reason to rein in the cost of externalities like pollution, but doing so using a populist approach to attack the mining industry ended in disaster for everyone. Australians missed the opportunity to capture the benefits of the mining boom and then forgot to implement a proper emissions trading scheme. If the targeting of industries for revenue extraction was based on the prevalence of high-wealth individuals in the Forbes list, then the packaging and media industries should get a guernsey, too. Note there are no bankers on the list! It will be interesting to see how the banks react. The carbon tax potentially impacted mining industry profits (it is difficult to pass on costs to customers in commodity export industries). And the Association of Mining and Exploration Companies' advertisements worked. The big question is whether the banks will do the same. They may simply pass on the costs to consumers and quietly simmer away. But I daresay the backlash has already started. What I find interesting is the basis of the claims and counter-claims about industry profitability and the value of particular industries to the nation. Given that almost all Australian workers have super funds that invest in Australian shares, which more than likely include the big miners and the big banks, one might think that targeting successful industries was counter-productive. 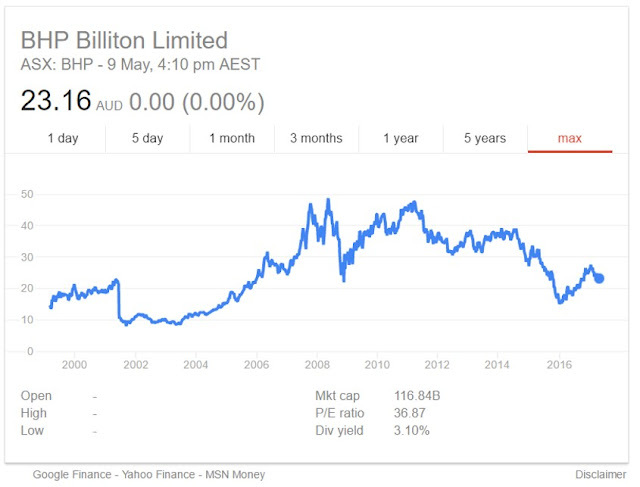 By way of example, BHP's performance since the global financial crisis (GFC) of 2008 is shown below. Notice how, due to global market factors and the change in value of the Australian dollar, BHP shares have not recovered their pre-GFC value. 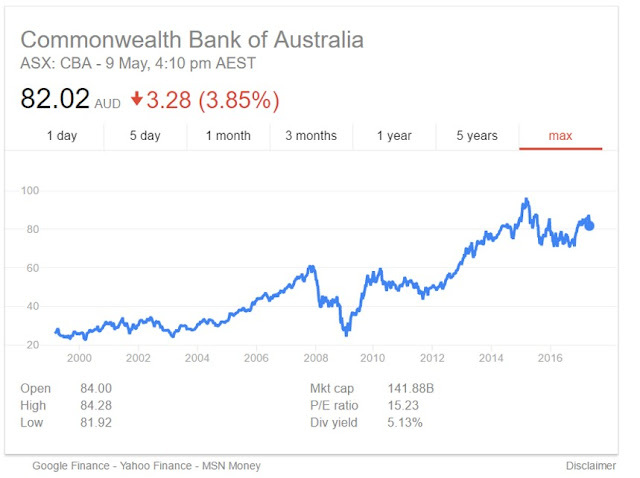 The Commonwealth Bank, however, has been travelling quite well. What happens to the share value of the major banks remains to be seen, but it can't be good for investors. If the major banks choose to pass on the increased costs to shareholders and consumers, the impact upon households may be significant. If the Australian Bankers' Association launches a counter-offensive, then the budget will be ineffective as in past years. How did this happen? I suspect that the lumbering, inefficient nature of liberal democracy is largely to blame. Citizens do not want to pay more tax, consumers do not want to pay higher prices, but somebody has to pay. If only it could be as simple as saying this is what everything costs, and this is how much tax will be charged. But it is never so simple. The political process is inevitable. The only way to overcome politics is to allow tyranny. Most people don't want this, so the system evolves as it has. But a cold, dispassionate view of the tax on the banks is that it is effectively a tax increase for everyone. That governments have to use smoke and mirrors to increase taxes is a consequence of the political process. Harold Lasswell's famous definition holds true: "Politics is who gets what, when, how". The key to good politics today is to hide how the getting gets done, and I think populism helps this cause immensely. PS: Ironically, the ABC's Budget Winners and Losers list shows taxpayers and banks side by side!